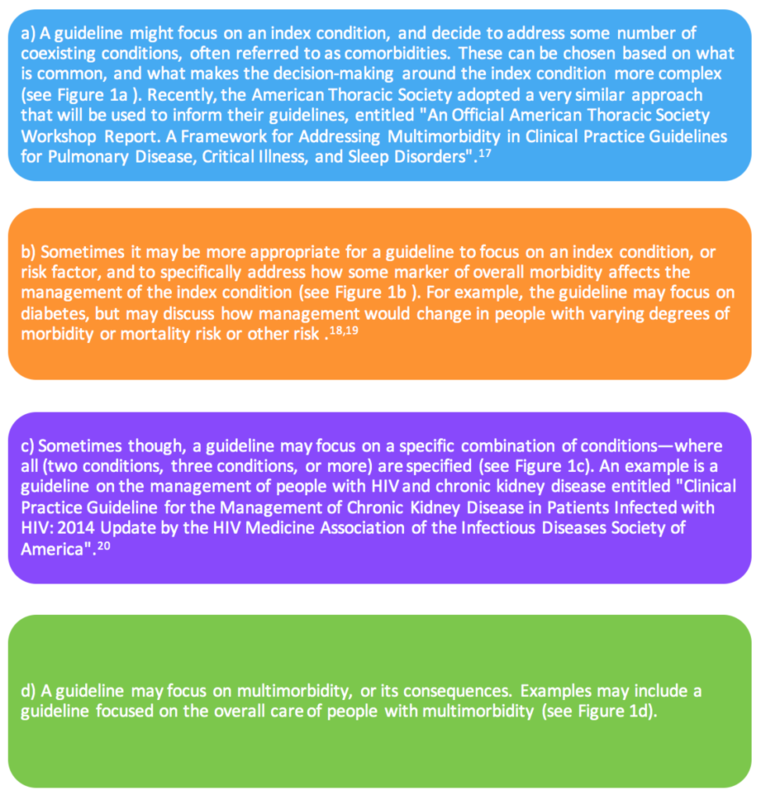 These are exciting times for the realm of multimorbidity in guidelines. Efforts to address this growing population are underway around the world. There is not a universal answer on how best to address people with multiple chronic conditions in guidelines; rather it depends on the specific question being addressed. The guideline addresses several key issues that matter to people with multiple chronic conditions, including reducing treatment burden (polypharmacy and multiple appointments). Second, the approach to care recommended for this population specifically focuses on shared decision making based on what is important to the person. This is just a snippet of all the innovative work being done to address the exciting opportunity to meet the needs of people living with multimorbidity through evidence-based medicine and person-centered care. These concepts are in no way contradictory to each other – our challenge, and work ahead, is to make sure both are realities for people living with multimorbidity. Uijen AA, van de Lisdonk EH. Multimorbidity in primary care: prevalence and trend over the last 20 years. Eur J Gen Pract. 2008;14 Suppl 1:28-32. Anderson G, Horvath J. Chronic Conditions: Making the Case for Ongoing Care. Partnership for Solutions; 2002. Fortin M, Bravo G, Hudon C, Vanasse A, Lapointe L. Prevalence of multimorbidity among adults seen in family practice. Ann Fam Med. 2005;3(3):223-228. Fortin M, Hudon C, Haggerty J, Akker M, Almirall J. Prevalence estimates of multimorbidity: a comparative study of two sources. BMC Health Serv Res. 2010;10:111. Kronick RG, Bella M, Gilmer TP, Somers SA. The faces of Medicaid II: Recognizing the care needs of people with multiple chronic conditions. Center for Health Care Strategies, Inc.; October 2007.
van der Lee JH, Mokkink LB, Grootenhuis MA, Heymans HS, Offringa M. Definitions and measurement of chronic health conditions in childhood: a systematic review. JAMA. 2007;297(24):2741-2751. AHRQ. Optimizing prevention and healthcare management for the complex patient (R21). 2007. Safford MM, Allison JJ, Kiefe CI. 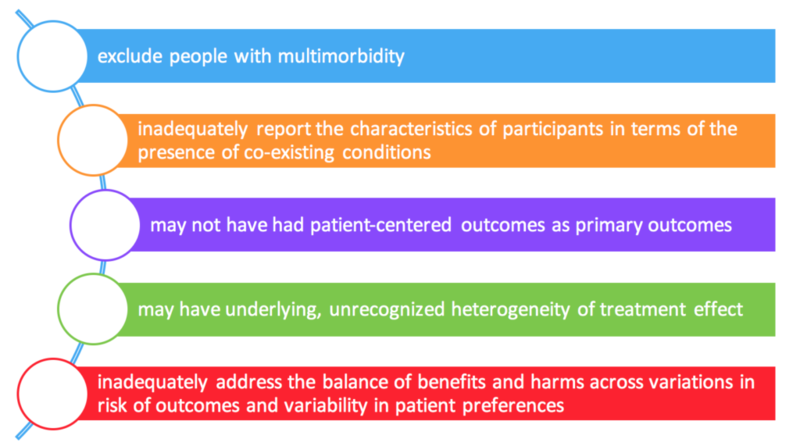 Patient complexity: more than comorbidity. the vector model of complexity. J Gen Intern Med. 2007;22 Suppl 3:382-390. Parekh AK, Barton MB. The challenge of multiple comorbidity for the US health care system. JAMA. 2010;303(13):1303-1304. Parekh AK, Goodman RA, Gordon C, Koh HK. Managing multiple chronic conditions: a strategic framework for improving health outcomes and quality of life. Public Health Rep. 2011;126(4):460-471. Boyd CM, Darer J, Boult C, Fried LP, Boult L, Wu AW. Clinical practice guidelines and quality of care for older patients with multiple comorbid diseases: implications for pay for performance. JAMA. 2005;294(6):716-724. Fortin M, Contant E, Savard C, Hudon C, Poitras ME, Almirall J. Canadian guidelines for clinical practice: an analysis of their quality and relevance to the care of adults with comorbidity. BMC Fam Pract. 2011;12:74. Lugtenberg M, Burgers JS, Clancy C, Westert GP, Schneider EC. Current Guidelines Have Limited Applicability to Patients with Comorbid Conditions: A Systematic Analysis of Evidence-Based Guidelines. PLoS ONE 2011;6(10):e25987. Mutasingwa DR, Ge H, Upshur RE. How applicable are clinical practice guidelines to elderly patients with comorbidities? Can Fam Physician. 2011;57(7):e253-262. Guidelines CoSfDTCP, Medicine Io. Clinical Practice Guidelines We Can Trust. The National Academies Press; 2011. Uhlig K, Leff B, Kent D, et al. 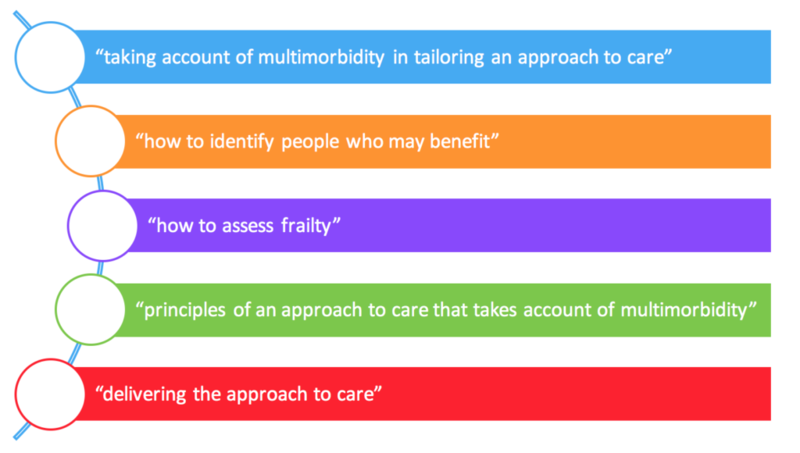 A framework for crafting clinical practice guidelines that are relevant to the care and management of people with multimorbidity. J Gen Intern Med. 2014;29(4):670-679. Wilson KC, Gould MK, Krishnan JA, et al. An Official American Thoracic Society Workshop Report. A Framework for Addressing Multimorbidity in Clinical Practice Guidelines for Pulmonary Disease, Critical Illness, and Sleep Disorders. Ann Am Thorac Soc. 2016;13(3):S12-21. You JJ, Singer DE, Howard PA, et al. Antithrombotic Therapy for Atrial Fibrillation: Antithrombotic Therapy and Prevention of Thrombosis, 9th ed: American College of Chest Physicians Evidence-Based Clinical Practice Guidelines. Chest. 2012;141(2_suppl):e531S-e575S. Mangione CM, Moreno G, Geffen D, et al. Guidelines abstracted from the American Geriatrics Society Guidelines for Improving the Care of Older Adults with Diabetes Mellitus: 2013 update. J Am Geriatr Soc. 2013;61(11):2020-2026. Lucas GM, Ross MJ, Stock PG, et al. Clinical practice guideline for the management of chronic kidney disease in patients infected with HIV: 2014 update by the HIV Medicine Association of the Infectious Diseases Society of America. Clin Infect Dis. 2014;59(9):e96-138. 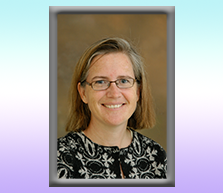 Dr. Cynthia Boyd, MD MPH is an Associate Professor of Medicine in the Division of Geriatric Medicine and Gerontology at Johns Hopkins University School of Medicine. She has focused her research career on the care of people with multiple chronic conditions, including the development and application of guidelines for people living with multiple chronic conditions, or multimorbidity.